One of the best reasons that an empty house is a great house is because it is so peaceful and quiet. Such conditions are great for a lot of different activities, but none so more than reading! This is simply because reading requires the most focus and attention, compared to other activities such as getting your beauty rest. But at the same time, you can benefit so much from reading, not only from an intellectual level, but even at a social level as well. Let’s discuss how! Reading is the perfect activity to do when the house is empty and therefore peaceful and quiet. Whenever you read a good book, you brain activity shoots through the roof. Especially if you make sure that you are fully absorbing everything you read. You see, your brain needs to be working at its best not just to retain every single detail that you read about certain characters, but also to think critically and understand the various themes within the book itself. If you’re like me, you may feel like reading is too much effort (especially compared to the advent of movies), but let me tell you that after reading more on a regular basis, I began to think faster overall, and be able to concentrate more effectively at work. It makes a huge difference on your intellectual capacity, which is a big reason why reading is so great. Another great thing about reading is that it can be a gateway to further discussion and interactions, primarily through book clubs. 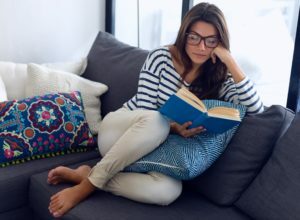 By being part of a book club and reading a particular book as part of said club, you can not only experience the joy of reading in the comfort of your own home, but you can take your thoughts and feelings about the book after you’ve finished reading it, and discuss it with other women like yourself. A book club that you join Plus book clubs are a great way to get recommended books for you so you don’t have to waste any time trying to figure out which book you should read next. A book club that you join can be comprised of all your friends, or even with people you don’t know that well (such as neighbors). 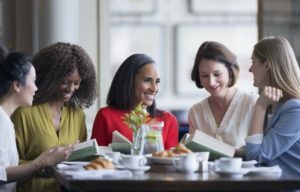 In this way, book clubs also help you to rekindle and further friendships with old friends, and create new and exciting friendships with new people. By reading as part of a book club, you can not only strengthen your current friendships but even make new ones as well. I will be the first to admit that watching movies is so fun and obviously does not require as much effort from your brain as reading does. However, reading has its own unique attribute that makes it valuable from an entertainment aspect as well. When you read a book, because your brain is actively trying to think of all the details for you, the natural tendency is for people to actually get immersed in the world they are reading about. This is why people so often “get lost” in their book and spend hours reading without realizing how much time has gone by. On the other hand, movies present all the details for you without your brain doing much other than processing what you see and hear (which is much easier to do than to comprehend words on a page). As a result, although the visual and sound effects may be amazing, the movie itself is just a spectacle and something that you watch from the outside looking in. Again, this is not to say that watching movies is a bad prospect – I mean, we DID write an entire article about watching movies. We are merely saying that both forms of entertainment are unique in their own right and you should definitely be taking advantage of both movies and reading, rather than solely relying on one over the other. Reading itself is a fairly simple concept, but if you really want to make the most out of your reading endeavors, you should follow the tips outlined below. To start, you need to find a good book. If you are in a book club, then you can easily defer to the other women when it comes to picking the next book to read. That makes it much easier for you. But if you are reading on your own, then you need to think about what sort of book you want to read. This obviously comes down to preference, but if you need ideas, there are plenty of book lists that can point you in the direction of the next book to read. The next step is to find a good place to read within your house. Obviously the most important thing is to find something that is comfortable to you, but also conducive to reading. A good sofa or couch is typically where most people read. If you want to get really cozy, you can even cover yourself with a warm blanket. Or you can make yourself some coffee or tea to really get you in the mood. Do whatever makes you comfortable and mentally prepared for the reading that is about to take place. One thing that we highly advise against though is reading while in your bed. The reason is that you can very easily end up falling asleep while in bed, especially if you get to a part of the book that is less exciting. As comfortable as your bed may be, avoid reading there at all costs, especially if you are known to fall asleep fairly easily. Be sure to read somewhere comfortable, such as on your living room sofa. Once you’ve figured out what book to read next, and where you are planning to reading, that is honestly about it. All you need to do is to get to it and start reading! One final tip though is to do your best to read when your mind is clear and you are fully awake. Even if you aren’t reading in your bed, you may still be prone to falling asleep (although the risk will be much lower), so always try to set aside time for reading when you are in your most awake state. Even though we’ve all probably read much more actively in our younger years, for most of us those days are long gone. However, that really shouldn’t be the case, as being an avid reader can not only improve your intellectual capacity, but expand on your social circle as well. As much as you think reading is boring or not useful, I challenge you to try picking up a good book just one more time, find yourself a nice place to read said book, and just get to it and see how you feel. By the time you’ve finished reading the book after a couple of days or weeks, hopefully you can see the benefits of reading and make it a more integral part of your everyday life.